^ a b c d e f g h i Knott, Emily (7 October 2004). "Asteroidea. Sea stars and starfishes". Tree of Life web project. Retrieved 10 May 2013. ^ Sweat, L. H. (31 October 2012). "Glossary of terms: Phylum Echinodermata". Smithsonian Institution. Retrieved 12 May 2013. ^ a b c Fox, Richard (25 May 2007). "Asterias forbesi". Invertebrate Anatomy OnLine. Lander University. Retrieved 19 May 2012. ^ a b Crump, R. G.; Emson, R. H. (1983). "The natural history, life history and ecology of the two British species of Asterina" (PDF). Field Studies. 5 (5): 867–882. Retrieved 27 July 2011. ^ Byrne, M. (1996). "Viviparity and intragonadal cannibalism in the diminutive sea stars Patiriella vivipara and P. parvivipara (family Asterinidae)". Marine Biology. 125 (3): 551–567. doi:10.1007/BF00353268 (inactive 14 March 2019). ISSN 0025-3162. ^ Vickery, M. S.; McClintock, J. B. (1 December 2000). 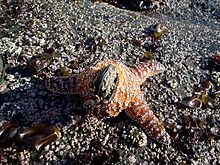 "Effects of food concentration and availability on the incidence of cloning in planktotrophic larvae of the sea star Pisaster ochraceus". The Biological Bulletin. 199 (3): 298–304. doi:10.2307/1543186. ISSN 0006-3185. JSTOR 1543186. PMID 11147710. 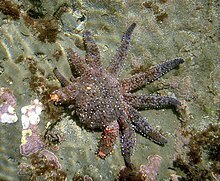 ^ a b "Asteroidea (Sea Stars)". Encyclopedia.com. Grzimek's Animal Life Encyclopedia. 2004. Retrieved 14 July 2012. ^ Wagner, S. C. (2012). "Keystone Species". Nature Education Knowledge. Retrieved 16 May 2013. ^ "100 of the World's Worst Invasive Alien Species". Global Invasive Species Database. Retrieved 16 July 2010. ^ a b Mah, Christopher (20 April 2010). 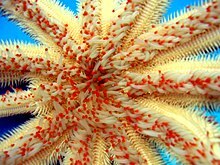 "Sea star defense". The Echinoblog. Retrieved 30 May 2013. ^ Shedd, John G. (2006). 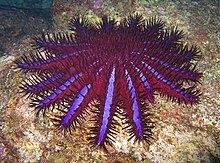 "Crown of Thorns Sea Star". Shedd Aquarium. Archived from the original on 22 February 2014. Retrieved 22 May 2013. ^ a b Wagonner, Ben (1994). 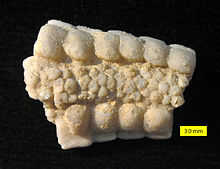 "Echinodermata: Fossil Record". 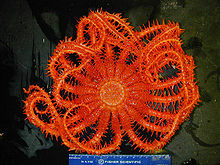 Echinodermata. The Museum of Paleontology of The University of California at Berkeley. Retrieved 31 May 2013. ^ a b Knott, Emily (2004). "Asteroidea: Sea stars and starfishes". Tree of Life web project. Retrieved 19 October 2012. ^ Hansson, Hans (2013). "Asteroidea". World Register of Marine Species. Retrieved 19 July 2013. ^ "Etymology of the Latin word Asteroidea". MyEtymology. 2008. Retrieved 19 July 2013. ^ Wray, Gregory A. (1999). 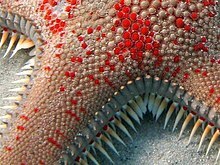 "Echinodermata: Spiny-skinned animals: sea urchins, starfish, and their allies". Tree of Life web project. Retrieved 19 October 2012. 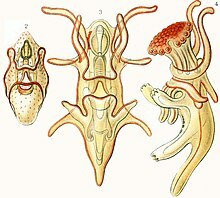 ^ Stöhr, S.; O'Hara, T. "World Ophiuroidea Database". Retrieved 19 October 2012. ^ Mah, Christopher (2012). "Brisingida". World Register of Marine Species. Retrieved 15 September 2012. ^ Downey, Maureen E. (1986). "Revision of the Atlantic Brisingida (Echinodermata: Asteroidea), with description of a new genus and family" (PDF). Smithsonian Contributions to Zoology: 435. Smithsonian Institution Press. Retrieved 18 October 2012. ^ Mah, Christopher (2012). "Forcipulatida". World Register of Marine Species. Retrieved 15 September 2012. ^ Mah, Christopher (2012). "Notomyotida". World Register of Marine Species. Retrieved 15 September 2012. ^ Mah, Christopher (2012). "Paxillosida". World Register of Marine Species. Retrieved 15 September 2012. ^ Mah, Christopher (2012). 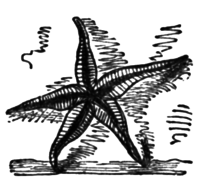 "Astropecten polyacanthus Müller & Troschel, 1842". World Register of Marine Species. Retrieved 6 July 2013. ^ Mah, Christopher (2012). "Spinulosida". World Register of Marine Species. Retrieved 15 September 2012. ^ Mah, Christopher (2012). "Echinaster (Echinaster) sepositus (Retzius, 1783)". World Register of Marine Species. Retrieved 6 July 2013. ^ Mah, Christopher (2012). "Valvatida". World Register of Marine Species. Retrieved 15 September 2012. ^ Mah, Christopher (2012). "Culcita (Agassiz, 1836)". World Register of Marine Species. Retrieved 6 July 2013. ^ Mah, Christopher (2012). "Dermasterias imbricata (Grube, 1857)". World Register of Marine Species. Retrieved 6 July 2013. ^ Mah, Christopher (2012). "Xyloplax Baker, Rowe & Clark, 1986". World Register of Marine Species. Retrieved 6 July 2013. ^ Mah, Christopher (2012). "Velatida". World Register of Marine Species. Retrieved 15 September 2012. ^ Mah, Christopher (2012). 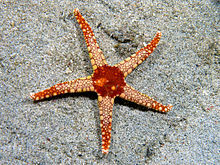 "Pteraster tesselatus Ives, 1888". World Register of Marine Species. Retrieved 6 July 2013. ^ "Family Calliasterellidae". Paleobiology Database. Retrieved 10 May 2013. ^ Ted Ranosa (19 June 2015). 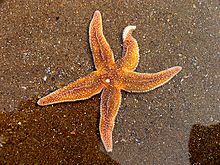 "Starfish Shows Off Strange Ability To Expel Foreign Objects Through Skin". Tech Times, Science. Archived from the original on 1 January 2016. ^ "William Jenkyn Thomas, M.A". The Aberdare Boys' Grammar School. Retrieved 12 May 2013. ^ "SpongeBob SquarePants". Patrick. Nickelodeon. 2013. Retrieved 16 May 2013. ^ Amakusa TV Co. Ltd. (7 August 2011). "Cooking Starfish in Japan". ebook10005. Amakusa TV. Retrieved 18 May 2013. 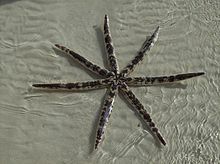 ^ "Starfish". Larva Labs. Retrieved 10 May 2013. ^ Starfish Associates LLC (2005–2013). "Starfish". Starfish Associates. Retrieved 10 May 2013. ^ "HM Submarine Starfish". Submarines: Chatham built. 1 July 2013. Retrieved 13 July 2013. ^ Dyal, P. (10 December 1965). "Operation Dominic. Fish Bowl Series. Debris Expansion Experiment" (PDF). Report ADA995428. Air Force Weapons Laboratory. Retrieved 11 May 2013.